What’s the future of tattoos? There are innovative ways tattoos are being used, including medical alert tattoo and smart tattoos that monitor health. Tattoos have come a long way since Sailor Jerry was inking pinup girls, hearts, dice, and anchors on servicemen who were enjoying shore leave. Today, over half of American women (58%) have a tattoo. Tattoo enthusiasts spend over $3 billion each year in the U.S. on new, colorful designs to decorate their skin. The popularity of tattoos shows no sign of lessening. In fact, developments in the industry mean that we could be seeing some incredible innovations. Read on to find out about the future of ink! Even if you don’t use one yourself, you’re probably aware of the popularity of “wearables.” Wearables are clothing, watches, jewelry, and other accessories that track data about the wearer’s health. Wearables can monitor and record one’s heart rate, blood pressure, calories expended, and more. As with any technology, however, smart watches and wristbands have their drawbacks. They’re battery-powered, so they need to be recharged often. They must also get fitted with a new battery when the old one wears out. They can also be temperamental and inconsistent. As “smart” as they are, they do not seamlessly integrate with the wearer’s body. Researchers from Harvard University and MIT are working on a solution in the form of tattoo ink. Biosensitive inks react to the body’s interstitial fluid, which surrounds cells within the bloodstream. Depending on the conditions of this fluid, the tattoo will actually change color. A green ink becomes darker as the body’s level of sodium rises, indicating dehydration. Another ink changes from green to brown as glucose concentration increases. This could someday be a boon to diabetics. These inks aren’t yet ready to be shipped to tattoo artists near you, however. They have gone through testing on pig skin, but require more research before they can be tried on human patients. Most people who opt to get tattoos choose their designs based on aesthetic appeal. Medical alert tattoos perform another role: they can be useful in the event of an accident or other dangerous situation. Patients with Type 1 Diabetes, asthma, or life-threatening food allergies are increasingly turning to tattoos to communicate their medical issues. Medical alert tattoos eliminate the patient’s need to wear a clunky, unattractive bracelet or necklace. They are easier to spot than a wallet card and guaranteed to be with the patient at all times. Unfortunately, medical alert tattoos aren’t regulated or standardized. Emergency responders aren’t trained to look for these tattoos. There is no agreed-upon standard for size, design, or location on the body. If you are considering a medical alert tattoo, choose one that incorporates the recognizable medical alert symbol. It should also use clear lettering to indicate your disease or condition. It’s also smart to wear your bracelet or continue to carry your wallet card, just in case. As far as placement, the best site is on your left wrist or forearm. This is where medical alert bracelets are generally worn — and where emergency responders will look first. Do you feel naked when you don’t have your smartphone on you? Guess what — cellphone maker Nokia is developing technology that will take the notion of connectivity one step further. Haptic feedback technology tattoos have the ability to link to your smartphone. When the phone rings, the tattoo responds and creates a physical sensation. Imagine if every time you get a phone call, a spot on your arm tingles. Just like your phone, a haptic tattoo would also indicate an incoming text, social media notification, or email. To dismiss the notification, you simply scratch your skin as though scratching an itch. Haptic feedback tattoos are still in the development phase. In other words, it’s too soon to get excited about (or terrified by) this technology. Do you work for a conservative company, but spend a lot of nights in clubs or at raves? A glow in the dark tattoo might be a good choice for you. These use UV (ultraviolet) ink that can only be seen under black light. Glow in the dark tattoos aren’t entirely invisible in the daytime. A sharp-eyed observer will see the scar. The color, however, isn’t visible in daylight or traditional lighting. It only becomes apparent in black light. Have you ever had a lover’s name tattooed on your bicep, only to regret it when the inevitable breakup occurs? 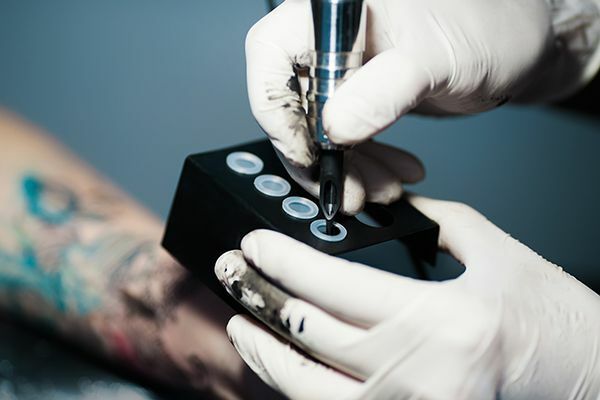 Tattoo removal is incredibly expensive, painful, and time-consuming. Thanks to researchers, truly temporary tattoos (that don’t come out of a gumball machine!) could well be an option very soon. So-called combustible tattoos utilize a vegetable-based ink. The ink is stored in microcapsules and can be easily and painlessly removed by a laser. This ink, if commercially available, would make it easier for the commitment-phobic to get a tattoo. Ready to Get Your Own Medical Alert Tattoo? Technology is taking the ancient art form of tattooing in some remarkable new directions. It’s pretty incredible to think that our descendants might be storing their medical information, communicating with others, or even viewing films right there on their skin. Even though most of the tattoo tech discussed in this article isn’t yet available, there are still many different options for getting a tattoo today. Whether you want an old-school skull, a realistic portrait, a Japanese design, or something cutting edge like a trash polka tattoo, we can turn your inky dreams into reality. Contact Skin Factory Tattoo today!